A revolutionary new drill rig – The RoXplorer® coiled tubing (CT) rig – has been licenced to one of the world’s leading global mining equipment, technology and services (METS) companies, IMDEX. A prototype of the Australian innovation, developed by Deep Exploration Technologies Cooperative Research Centre (DET CRC), is also undergoing final preparations for a drilling trial on a Barrick Gold exploration site in Nevada, USA. The RoXplorer® CT rig is a revolutionary change in mineral exploration drilling where individual drill rods have been replaced by a continuous steel coil. Drilling and tripping into and out of the hole proceeds without the need to connect and disconnect rods, making drilling safer, faster and cheaper. The rig is driven by downhole (as opposed to conventional surface) motors and is smaller, has lower fuel consumption and a smaller footprint than equivalent conventional drill rigs. Additional environmental benefits stem from its deployment with a solids removal unit meaning no sumps are dug and no drilling fluids released to the surface. Derek Loughlin, Global Business Development Director at IMDEX said that the company intends to work closely with Barrick Gold on the Nevada trial and in identifying the appropriate commercial model by which the technology will be brought to market. “The RoXplorer® CT rig is a technology that could be disruptive to conventional drilling methods with the promise of significant productivity, safety and environmental performance. Whilst IMDEX does not intend to enter the drill rig manufacturing or drill rig operating businesses we recognise the valuable role that our technologies could play as part of the overall CT drilling system,” he said. Andy Wurst, Chief Geoscientist, Global Project Generation and Innovation at Barrick Gold said the company was looking forward to deploying the RoXplorer® coiled tubing drilling system in Nevada and trialling the capability of the revolutionary drill rig. “The RoXplorer® promises to fundamentally improve drilling safety and efficiency and change the very way the industry approaches minerals exploration, which could in effect increase mineral deposit discovery rates, globally. We’re excited to put it through its paces in a real world exploration scenario in Nevada, and are working with IMDEX to bring the technology to market,” he said. The Nevada trial will also incorporate IMDEXs Lab-at-Rig® technology (licenced from DET CRC in 2015) providing real-time geochemistry from the drill cuttings. DET CRC Chairman Tom Whiting said he was delighted with the achievements of the research centre, which officially concluded on 30 June 2018 after eight years of innovation. “All of DET CRC’s major technologies (Wireless Sub, Lab-at-Rig®, AutoSonde, AutoShuttle and RoXplorer® CT drilling system) have been taken to working prototype and licenced in revenue-generating agreements to our supplier participants, Boart Longyear and IMDEX. I couldn’t be happier with the final outcomes,” he said. 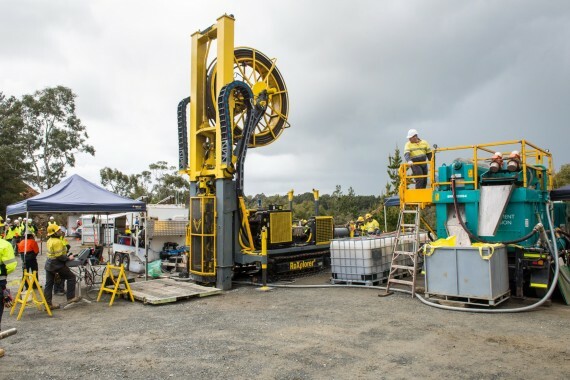 DET CRC gratefully acknowledges the hard work of the project team led by Soren Soe in developing the RoXplorer® coiled tubing drilling system and the contributions from project parties Boart Longyear, CSIRO, Curtin University, University of South Australia, University of Adelaide and IMDEX. DET CRC also wishes to acknowledge Barrick Gold for its significant financial, logistical and technical support toward the Nevada trial and for its leadership in helping to ‘pull-through’ the technology from prototype towards commercial product. The RoXplorer® coiled tubing drilling system received a CRC Association Award for Innovation in May 2018. IMDEX is a global mining equipment, technology and services (METS) company. The company’s integrated solution sets improve the process of identifying and extracting what is below the earth’s surface for drilling contractors and resource companies. IMDEX is a Participant in DET CRC. Barrick Gold is the largest gold mining company in the world, with its headquarters in Toronto, Ontario, Canada. Barrick Gold is a Participant in DET CRC.